Welcome to our website. 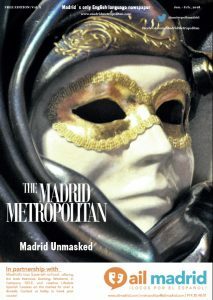 The Madrid Metropolitan was founded in December 2016 as an English language printed and online newspaper for the English-Speaking community of the Madrid region highlighting what to do, community events, news and insights for residents and visitors alike. The paper is published monthly and reaches a wider audience online. In February 2018 the Madrid Metropolitan entered into a partnership with Central European News Ltd for a joint partnership platform for daily Spanish news.